Features: - Kawaii anime live video wallpaper with support forphones and tablets - You can disable sliding between screens insettings - Frame rate can be changed in settings too - Thisapplication is absolutely free - No in-app purchases We hope you'llenjoy this anime wallpaper as we do, also don't forget to rate it,so we'll know how you liked it. NOTE: All rights goes to theiroriginal owners. All credits goes to the original artists. Forimprovement wishes and exclusive orders please contact us here:[email protected] Don’t forget to check our otherwallpapers too! Thanks! =^_^= This application is based on the"Piapro" Character license It depicts the character "Hatsune Miku"of Crypton Future Media Corporation. "Hatsune Miku" is acopyrighted work of Crypton Future Media Corporation. (C)CryptonFuture Media, INC. www.piapro.net Hatsune Miku (Japanese: 初音ミク),sometimes referred to as Miku Hatsune, is a humanoid persona voicedby a singing synthesizer application developed by Crypton FutureMedia. Hatsune Miku is portrayed as a 16-year-old girl with long,turquoise twintails. She uses Yamaha Corporation's Vocaloid 2 andVocaloid 3 singing synthesizing technologies. She also uses CryptonFuture Media's Piapro Studio, a singing synthesizer VSTi Plugin.She was the second Vocaloid sold using the Vocaloid 2 engine, andthe first Japanese Vocaloid to use the Japanese version of theVocaloid 2 engine. Her voice is modeled from Japanese voice actressSaki Fujita. Hatsune Miku has performed at her concerts onstage asan animated projection. The name of the character comes frommerging the Japanese words for first (初 hatsu), sound (音 ne) andfuture (ミク miku), thus meaning "the first sound from the future",referring to her position as the first of Crypton's "CharacterVocal Series." Kawaii anime live video background withgreatquality.Features:- Kawaii anime live video wallpaper with support for phonesandtablets- You can disable sliding between screens in settings- Frame rate can be changed in settings too- This application is absolutely free- No in-app purchasesWe hope you'll enjoy this anime wallpaper as we do, alsodon'tforget to rate it, so we'll know how you liked it.For improvement wishes and exclusive orders please contact ushere:[email protected]’t forget to check our other wallpapers too! Thanks! =^_^=Reimu Hakurei (博麗　霊夢 Hakurei Reimu) is the main character oftheTouhou Project along with Marisa Kirisame. As the shrine maidenofthe Hakurei Shrine, she manages the Hakurei Border of Gensokyoandexterminates troublesome youkai.PersonalityHer personality is straightforward, optimistic, and a bitcurious.She's quick to anger if offended, but just as quick tooffer helpto those in need. According to Komachi, Reimu has aninnocent heartthat can't truly hate anyone. While rather lazy inher free time,she's highly devoted to her duties as the HakureiShrine Maiden,resulting in a "shoot first and ask questions later"attitude toyoukai extermination. This makes her known toexterminate youkaiindiscriminately, regardless of how much of athreat they representto her or others. One example is Tokiko, whowas ambushed by Reimuwhile she was, in Reimu's own words, "readingand minding her ownbusiness".Apparently, however, she actually helps youkai in trouble whenitreally matters. For instance, in Silent Sinner in Blue, shekeptRei'sen (disguised as an earth youkai-rabbit) at her place tohelphealing her injuries, giving her the futon she uses to sleepandeven going to Eientei to inform its residents that a woundedrabbitwas at her shrine.It's been stated that Reimu treats everyone the same,whetherthey're humans, youkai or gods, giving them no particularrespector disrespect. This habit has caused her to inadvertentlybefriendmany youkai she defeats. While she tries to keep youkaiaway fromher shrine, this is because it makes it harder to do herjob ratherthan because she dislikes them. At the end of thesymposium inSymposium of Post-mysticism, when Reimu goes to breakit up, Mikonotes that though Reimu says she wants to eliminate allthe youkai,she actually just wants to attain a peace in Gensokyothat doesn'trequire violence, like the others present wish.Ability to floatWhile flight is extremely common among inhabitants ofGensokyo,Reimu's ability extends beyond that. She can use thispower toteleport short distances, but rarely seems to be aware thatshe'sdoing so. The ultimate expression of this ability isFantasyNature, which allows Reimu to float up high and become outof reachfrom enemies' attacks while active; this ability wasconsidered toopowerful for use as a spell card until MarisaKirisame gave it aname and time limit.Aura manipulationIt's stated in the omake.txt (おまけ.txt) of Embodiment ofScarletDevil that Reimu can control the natural spirits of livingthings,an ability which isn't listed in any source afterwards. Noclearinstance of this ability has been displayed in canon.Powers as the Hakurei Shrine MaidenAs the Hakurei shrine maiden, Reimu can handle the HakureiYin-YangOrbs, and is trained in youkai extermination techniques aswell asstandard duties like performing blessings. Reimu is alsocapable ofinvoking Gensokyo's native gods into her body, but sheisn'twell-trained enough to do so reliably. Features:- Kawaii anime live video wallpaper with support for phonesandtablets- You can disable sliding between screens in settings- Frame rate can be changed in settings too- This application is absolutely free- No in-app purchasesWe hope you'll enjoy this anime wallpaper as we do, alsodon'tforget to rate it, so we'll know how you liked it.For improvement wishes and exclusive orders please contact ushere:[email protected]’t forget to check our other wallpapers too! Thanks! =^_^=Ruby Rose is the main protagonist of RWBY. Ruby's weapon ofchoiceis her High-Caliber Sniper-Scythe (HCSS) known asCrescentRose.She first appeared in the "Red" Trailer visiting the grave ofherdeceased mother, Summer Rose. After an invitation fromHeadmasterOzpin following an altercation with Roman Torchwick, RubyattendsBeacon Academy to become a Huntress. She becomes the leaderof TeamRWBY, consisting of Weiss Schnee, Blake Belladonna andherhalf-sister, Yang Xiao Long.Ruby is a fair skinned young girl with silver eyes and blackhairthat fades to dark red at the tips cut in anasymmetricalbob.She wears a long sleeved thick black blouse with a high collarandred trim on the sleeves, a black waist cincher with red lacingupthe front, and a black skirt with red trim. She also wears apairof thick black stockings and black combat boots with red laces,redtrim around the top and red soles.Red trailer5Ruby with Crescent RoseHer outfit is topped by a red hooded cloak fastened to hershoulderby cross shaped pins. Her emblem appears as a large silverbroochand is pinned to a wide black belt slung around her hips onanangle, which also has bullets and a pouch attached.In the "Red" Trailer, Ruby's cloak is fastened at her throat andalarge silver cross is pinned to her belt in place ofheremblem.Ruby's pajamas consist of a black tank top with aheart-shapedBeowolf design on the chest and white long pants withpink roses asdecoration. She also wears a black sleeping mask withtriangularred eyes reminiscent of the Beowolves in hertrailer.At her home in Patch, Ruby's pajamas are a matchingdark-graylong-sleeved shirt and pants with faded-red polka dots anda whitelining at the front and the collar.During the events of "A Minor Hiccup" and "Painting theTown...",Ruby wears an alternate outfit codenamed "Slayer".This outfit consists of a long-sleeve, light gray shirt withblackbelted cuffs near the ends of the sleeves. Over top of thegrayshirt is a black pinafore with two vertical lines of redstitchingthat resemble the lacing on a corset. She wears a redskirt with alarge print of her emblem on the side of it in blackand blacktulle underneath.Her stockings and shoes remain the same as her Originaloutfit,except the boots no longer have red trim around the top. Afewpieces of metal arranged in an abstract shape are attached tohersleeve on her left shoulder, and her hooded cloak has beenwrappedaround her neck similar to a scarf before hanging downherback. Features: - Kawaii anime live video wallpaper with support forphones and tablets - You can disable sliding between screens insettings - Frame rate can be changed in settings too - Thisapplication is absolutely free - No in-app purchases We hope you'llenjoy this anime wallpaper as we do, also don't forget to rate it,so we'll know how you liked it. For improvement wishes andexclusive orders please contact us here: [email protected]’t forget to check our other wallpapers too! Thanks! =^_^= NOTE:All rights goes to their original owners. All credits goes to theoriginal artists. Fate/Zero (フェイト／ゼロ, Feito/Zero) is a novelwritten as a prequel to Fate/stay night Because of certain minordetails such as whether Gilgamesh had seen Excalibur or not duringthe 4th Holy Grail War, Fate/Zero is treated as being in anextremely similar parallel world to Fate/stay night. Fate/Zerotakes place 10 years prior to the events of Fate/stay night in theyear 1994, detailing the events of the Fourth Holy Grail War inFuyuki City. Originally founded by the Einzbern, Tohsaka, and Matoufamilies, the war involves seven Masters and seven Servants underseven classes: Saber, Lancer, Archer, Rider, Caster, Assassin andBerserker. After being defeated in three successive wars for theHoly Grail, the Einzbern family is determined to win the next oneat any cost and elects to hire the notorious Magus Killer,Kiritsugu Emiya, to become their representative in spite of hisreputation as an unconventional and ruthless hitman. For the nexteight years, he prepares the war in the Einzbern stronghold whileunexpectedly forming a family with Irisviel von Einzbern, who is tobecome the vessel for the Grail, and their daughter, Illyasviel.However, Kiritsugu must contend with six formidable opponents, allparticipating in the war for their own reasons. From one of thethree founding families, the magus Tokiomi Tohsaka wants to achieveAkasha through the Holy Grail, receiving support from the priestRisei Kotomine and his son, Kirei Kotomine, who is alsounexpectedly a master in the war. Unlike Tokiomi, Kirei has nodirection in life and soon sets his sights on Kiritsugu as ananswer to the frustrating lack of meaning in his life. Meanwhile,Kariya Matou becomes a Master after learning Tokiomi's youngerdaughter, Sakura, was adopted into the Matou family. In hopes ofsaving her from suffering at the hands of Zouken Matou, he agreesto win the Holy Grail in exchange for her freedom to return to herfamily. After learning of the war and taken by arrogance, ClockTower magus and lecturer Kayneth El-Melloi Archibald decides tojoin the battle to increase his own prominence within the Mage'sAssociation. However, his dismissive attitude towards the radicaltheories of his student, Waver Velvet, drives the young man tosteal Lord El-Melloi's artifact and participate in the war in orderto force the Mage's Association to recognize his genius. When aseventh magus fails to answer the Grail's call, a serial killernamed Ryuunosuke Uryuu is chosen to become the final Master in thewar. Seeking exciting new ways of killing people, he winds upsummoning a Servant from an occult book and proceeds to commit asmany unusual murders as he can with the help of his Servant. As thewar begins, only one will emerge victorious. Features:- Kawaii anime live video wallpaper with support forphones and tablets - You can disable sliding between screens insettings- Frame rate can be changed in settings too- Thisapplication is absolutely free- No in-app purchasesWe hope you'llenjoy this anime wallpaper as we do, also don't forget to rate it,so we'll know how you liked it.For improvement wishes and exclusiveorders please contact us here: [email protected]’tforget to check our other wallpapers too! Thanks! =^_^=My YouthRomantic Comedy Is Wrong, As I Expected (Japanese:やはり俺の青春ラブコメはまちがっている。 Hepburn: Yahari Ore no Seishun Rabu Kome waMachigatteiru. ), abbreviated as OreGairu (俺ガイル) and Hamachi (はまち),and also known as My Teen Romantic Comedy SNAFU, is a Japaneselight novel series written by Wataru Watari and illustrated byPonkan8.Yukino Yukinoshita is the student of Class-2J of Sobu Highand also the President of the Service Club. She was the lone memberuntil Hachiman Hikigaya joined her.Yukino is quite popular even forher cold personality. Because of her look and skills in variousfields, even Hachiman, who doesn't talk to anyone and doesn't evenknow his own classmate (Yui), recognized Yukino at the very instanthe met her in the club room.Trivia* Yukino's given name is also inpresent in her family name. Four other characters share thischaracteristic: Yui, Saki, Rumi, and Meguri. * Yukino is thefirst and only person in the series to whom Hachiman officiallytried to befriend, twice. * Part of her name "Yuki" in Japanesemeans "snow" probably in reference to her cold personality. * Herfull name literally translates into 'the snow beneath the snow'.Shetasted her first ramen with Hachiman and Shizuka in Kyoto* She isscared of dogs. * She loves the character Pan-san to theextent of having an in-depth knowledge of the item and a yearpassport for the place where the item is usually bought. * Shedrinks tea in the volunteers club in a fancy porcelain cup with itsown dish. * She is a cat-lover.She takes in things which are mostlyrelated to cats which also include colouring books, picture book,etc.She is often seen reading a book with a black cat on its cover*Yukino Yukinoshita has won an award as Best Female Character Awardat the 2015 NewType Awards held in Japan last October 10, 2015.However, her voice actress, Saori Hayami wa only nominated as BestVoice Actress. * It is widely theorized by fans that Hayato's "Yu"is her. At the summer camp, Hayato tried to talk with Hachimanabout someone whose name started with Yu before being interrupted.Furthermore, he also mentioned that an unanonymous "she" is keepingan aye on Hachiman. It should be noted that they were once closefriends. Features:- Kawaii anime live video wallpaper with support for phonesandtablets- You can select desired area and disable scrolling in settingsifyou don’t like this feature- Frame rate can be changed in settings too- This application is absolutely free- No in-app purchasesWe hope you'll enjoy this anime wallpaper as we do, alsodon'tforget to rate it, so we'll know how you liked it.For improvement wishes and exclusive orders please contact ushere:[email protected]’t forget to check our other wallpapers too! Thanks! =^_^=Megumin (めぐみん) is an Arch Wizard of the Crimson Magic Clan intheFantasy World, and is the first person to joinKazuma'sparty. Features:- You favorite anime and manga characters on your screen.-You can select desired area and disable scrolling in settings-Totally freePlease view our other anime live wallpapersNOTE:Allrights goes to their original owners. All credits goes to theoriginal artists.If you have any questions or requests pleasecontact us [email protected] is a beautiful HalfElf with long silver hair and purple blue eyes. She wears a whiteand purple outfit along with a white flower in her hair. Throughoutthe series, she has styled her hair in a variety of ways.Emilia isgood natured and likes to take care of others, though Emiliaherself refuses to admit it, instead thinking of it as her ownselfishness. She is indifferent to her own appearance, leaving Packto take care of her clothes and hair. Because her appearance issimilar to the Witch of Envy, she has received unfairdiscrimination from others. She sometimes acts like a child and isunacquainted with the world as she used to live in the woods withother Elves, though despite this she still works hard to become aking. Anime kawaii Pictures If you're an anime or manga fan, andespecially if you're a huge otaku, then Lively Anime Live Wallpaperis for you. Lively Anime Live Wallpapers is a fan based applicationto make your mobile screen more beautiful with animated, lively,kawaii girls. It's a real live wallpaper where high quality HDanime girls liven up your screen with cute animations to improveyour mood and keep you company. Anime kawaii PicturesLive Wallpapercontains alot of anime girls to make you happy.Anime kawaiiPictures an application that gives you a set of hot images fromadorable anime backgrounds and are divided and Enjoy an assortmentof beautiful and japanese stunning wallpapers to set to your phoneslock screen, background, and/or to a contact's photo and It is aphoto exhibition on the various anime.And the application AnimeWallpapers runs on the Internet by allowing every day send a photoand receive a new anime kawaii , with fantasy girls background youwill find the best category , girly m and phone wallpapers ,girly mcouples.Customize your background with the brand new kawaii GirlWallpaper HD and stunning wallpapers ! Welcome to the “anime world”where the best cartoon characters live! If you simply adoreJapanese animated cartoons to watch, you will love this “animeapp”! Don't miss the chance to free download ultra hd themebackgrounds for phone ! beautiful cartoon “Cute anime girlwallpaper” will be a perfect decoration for every boy and girl! Ourwallpaper app includes a variety of cartoon themes of pretty beautygirls also baby girl. There are many anime fans around the worldlove Anime kawaii Themes , enthusiasts have produced fan fictionand fan art. We created a special and unique “anime livewallpaper”. If you like animation, Cute anime girl, broughttogether a variety of cartoon character illustration can be yournew animated desktop background! Get this “anime free wallpaper”and enter the world of fantasy animation kawaii!Use the Anime GirlsWallpaper HD, personalize your phone screen with the lovely Animekawaii Themes, make your phone more beautiful with animatedbackgrounds . The most beautiful “anime themes” are waiting for youif you download this free application! Set free anime lock screenand enjoy the wonderful sight! Be a real anime freak, get this“anime live wallpaper free”! Set the best collection of “animepics” and choose your favorite as your display background. Writeyour own anime love story on the wall! Decorate your screen withthe best “cartoon picture app”! Get free "anime boy wallpaper" andenjoy beautiful sight from your smartphone! Set your favorite"cartoon image" and keep this fan app close to you!CopyrightNotice:Every one of our pictures have been several people severaltimes audit to ensure each picture is not involved in copyright andtrademark issues. Our pictures are saved on our own server. If youfind a picture of which may involve copyright disputes Pleasecontact us first remove the picture.Finally, sincerely hope youwill like our wallpaper applications, and find what you want. kawaii cute wallpapers ✪✪✪✪✪✪✪✪✪✪" Kawaii cute Wallpapers " A newwallpapers app with beautiful pictures of kawaii! such as Kawaiigirl Anime , Kawaii boy Anime ,cute panda ,cute Kawaii ,cuteJapanese anime , Japanese girl and boy, kawaii cut.....Kawaii Cute wallpapers Patternator has a lot of wonderfulcollection Wallpapers kawaii, If you are one of those who loves thefantasy world of these amazing Kawaii images wallpapers, well lookno more, here is where you get a ton of stuff just related tothat. ✪✪✪✪✪✪✪✪✪✪ TOP Features Kawaii cuteWallpapers:✪✪✪✪✪✪✪✪✪✪In Kawaii cute Wallpapers you willhave: ★ ->Wallpapers in HD ★ ->New pictures andbackgrounds added automatically.★ ->Includes almost everyawesome Kawaii there is.★ ->The entire collection is above morethan 150 wallpapers.★ -> Regular Update with new pictures★->The images can easily be saved to your phone/tablet. Check the HD background & wallpaper collectiontime after time because it will get updated.❤ Wallpapers kawaiicute girl anime Japanese❤ Wallpapers kawaii cute boy animeJapanese❤ Wallpapers kawaii cute cut ❤ Wallpapers kawaii cute panda❤ Wallpapers kawaii KleptoCats✪✪✪✪✪✪✪✪✪✪ Disclaimer✪✪✪✪✪✪✪✪✪✪ None of the images are hosted on the app. Alllogos/images/names are copyrights of their perspectiveowners. These images are not endorsed by any of theperspective owners, and the images are used simply for aestheticpurposes. No copyright infringement is intended, and any request toremove one of the images/logos/names will behonored.----------------------------------------------Please don´tforget to Rate and Post Comments. Thanks!! !Let’s download and setthis cool Kawaii images wallpapers make lightness life! If you like anime and Japanese drawings, the images 🐣 of thisapplication will enchant you !! Kawaii is a Japanese term used todescribe something nice and tender.🌈 The images you will find hereare cute and cute characters that you can install as wallpaper onyour phone. The kawaii 🐼 drawings are distinguished by pastelcolors, charismatic characters and super cute !!. A kawaii effectcan be applied to anything from food such as fruits, chocolates toanime and animal characters such as cute kittens. Kawaii Anime Girl is a launcher theme which has beautiful KawaiiAnime Girl wallpapers, Kawaii Anime Girl lock screen themes and aKawaii Anime Girl app icon packs. This beautiful theme is speciallydesigned for people who loves Kawaii Anime Girl. Download and applyKawaii Anime Girl for free to give your Android phone some style.And regardless of your phone's model, whether it's Samsung orHuawei, Kawaii Anime Girl is designed to let you enjoy a faster andsmoother mobile operating experience.Main Features of Kawaii AnimeGirl: 3D ThemesWe provide various kinds of 3D themes, our mainthemes include 3D technology, 3D koi live, 3D mechanic and the 3Datom theme. We also have a variety of festivals related 3D themeswith dynamic and sound effects, such as our Christmas and Halloweentheme. Furthermore the Kawaii Anime Girl theme also includes 3Dweather and 3D clock functions.Live WallpapersThere are plenty of3D live wallpapers, including the gold rose live wallpaper, 3D livewaterfall wallpaper, Dandelion live wallpaper and many more. Youcan also design and customize live wallpapers by yourself, and youcan even sell them online to other users to earn some extra cash!Our live wallpapers have many gestures and particles to make yourphone look cool.Other Features of Kawaii Anime Girl: Kawaii AnimeGirl App lock protects your apps' privacyKawaii Anime Girl screenlock (locker) protects your phone from intrudersStunning 3Dtransition effects with Kawaii Anime Girl live wallpaperSmartlocker and Charge Master to optimize your phone's performanceUseKawaii Anime Girl DIY function to create and customize yourfavorite themesBeautiful Kawaii Anime Girl and weatherbackgroundsKawaii Anime Girl app icon packs to give your phone acomplete makeoverCompatible with all Android phone including Sony,HTC etc.How to apply the Kawaii Anime Girl theme? To apply thetheme, please install our launcher first. 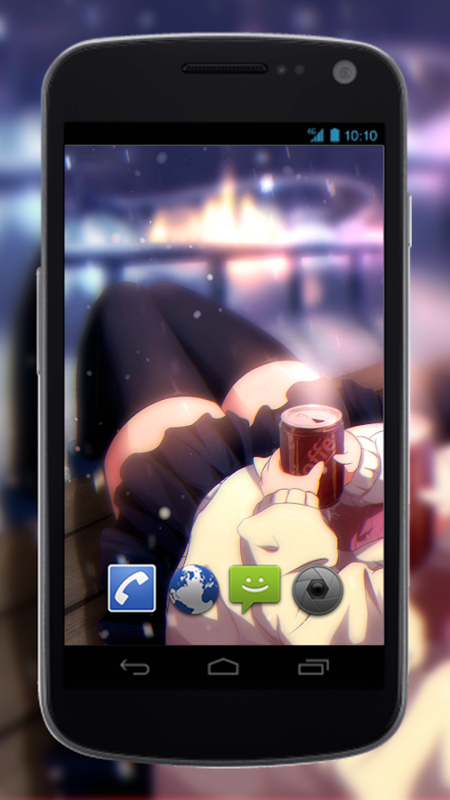 Apply the Kawaii AnimeGirl theme, to make your phone faster, orderly and cool. Theoriginal app icons, clock and weather theme of your phone will bereplaced by the Kawaii Anime Girl theme. We have designed manycustomized themes for popular apps, these include camera apps,social apps, entertainment apps, useful tools and messenger apps.Our app also provides you thousands of themes from othercategories, namely cartoon and anime themes, graffiti themes, goldthemes, pink themes, black themes, love themes and many more. Allof our beautiful themes are free and available at Google PlayStore. Download and apply Kawaii Anime Girl now! There are moresports (football, basketball), games and other beautiful themeswaiting for you! Getting bored with the Same old phone wallpapers ?Change your stylewith these cool Cute kawaii wallpapers Cute kawaii wallpapers A newwallpapers app with beautiful pictures ! Cute kawaii wallpapers hasa lot of wonderful collection Wallpapers cute kawaii anime girl ,If you are one of those who loves the fantasy world of theseamazing cute Kawaii anime girl images , well look no more. ✪ TOPFeatures Cute kawaii wallpapers :✪In Cute kawaii wallpapers youwill have: ★ ->Wallpapers in HD ★ ->New pictures andbackgrounds added automatically.★ ->Includes almost everyawesome Kawaii there is.★ ->The entire collection is above morethan 150 wallpapers.★ -> Regular Update with new pictures★->The images can easily be saved to your phone /tablet. Checkthe Cute kawaii wallpapers collection time after time because itwill get updated.❤ Wallpapers kawaii cute girl anime Japanese❤Wallpapers kawaii cute >>>> Disclaimer>>>>> None of the images are hosted on the app. Alllogos/images/names are copyrights of their perspective owners.These images are not endorsed by any of the perspective owners, andthe images are used simply for aesthetic purposes. No copyrightinfringement is intended, and any request to remove one of theimages/logos/names will behonored.----------------------------------------------Please don´tforget to Rate and Post Comments. Thanks!! !